Macrothrombocytopenia (MTC) is a hereditary disorder in the formation of platelets (thrombocytes), which are an important part of blood coagulation. Two mutations have been identified in the ß1-tubulin gene, one of which is recessive, while the other one is dominant. Indication for a congenital MTC is a reduced number of platelets, with counts ranging between 100.000 and 50.000 per µl or even below. Moreover, circulating platelets are larger than normal. 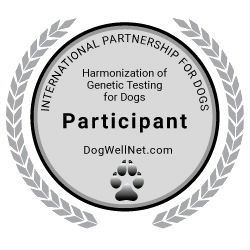 Heterozygous carriers of the dominant mutation have counts intermediate to affected and normal dogs, while carriers of the recessive mutation are indistinguishable to normal animals. Affected dogs do not have a bleeding diathesis, but there is a danger of malpractice. Symptoms mentioned above could be confused with acquired thrombocytopenia, which can be triggered by infection, medication or immune reactions. Because treatment with antibiotics or steroids is impropriate for the congenital MTC, this genetic test should be considered as a method of differential diagnosis.